Notes: Rocca Calascio is a mountaintop fortress or rocca in the Province of L'Aquila in Abruzzo, Italy. 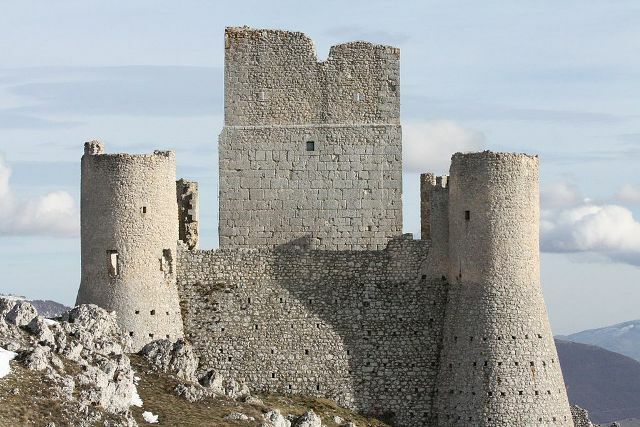 At an elevation of 1,460 metres (4,790 ft), Rocca Calascio is the highest fortress in the Apennines. Built of stone and masonry exclusively for military purposes and intended only to accommodate troops and never as residence for nobles, the fortress overlooks the Plain of Navelli at one of the highest points in the ancient Barony of Carapelle.Construction of the fortress started in the tenth century as a single watchtower. A walled courtyard with four cylindrical towers at the corners around a taller inner tower was added in the thirteenth century. The lower half of the fortress is built with distinctively larger stones than its upper half. It is believed that this feature was to make its base impenetrable to invaders. The fortress was never tested in battle. However, it was badly damaged in November 1461 by an earthquake with an estimated magnitude of 7 to 8 on the Richter Scale. While the town of Calascio, which lies below the fortress, was rebuilt, the fortress was not. Rocca Calascio lies within the Gran Sasso e Monti della Laga National Park and alongside the high plain of Campo Imperatore.